Flood defences, but at what cost? 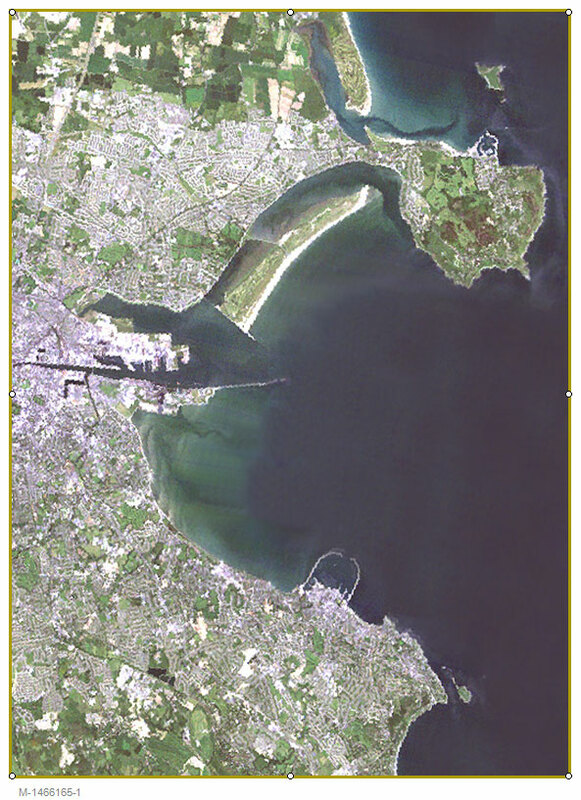 “The proposed Combined Flood Defence and New Water Main Project by Dublin City Council is due, we understand, to start on the seafront early in 2012. The planning process was completed in 2008. It has been designed to prevent potential further damage to homes and businesses along the seafront from flooding and to carry a new water main. It is to take the form of a continuous landscaped mound (or a solid wall where a mound is not practical) ranging in height from 1.5 m (5ft.) to over 2.57 m (over 8ft.) from Alfie Byrne Road to the Wooden Bridge. The existing wall will act as a primary defence with the new proposed mound/wallacting as a secondary defence. It has been designed to provide an adequate flood defence for a once in 100 year flood event and to also carry a new water main”. Read more here ‘Flood defences, but at what cost?. I wish to invite you to a public meeting which will address the proposed expansion of Dublin Port and the consequences this will have for Dublin Bay. This is in advance of the consultation day which Dublin Port Company have arranged for Clontarf Rugby Club on April 28th. This issue is a matter of huge concern for many residents in the area and that is why it is crucial that the community discuss our intended response. 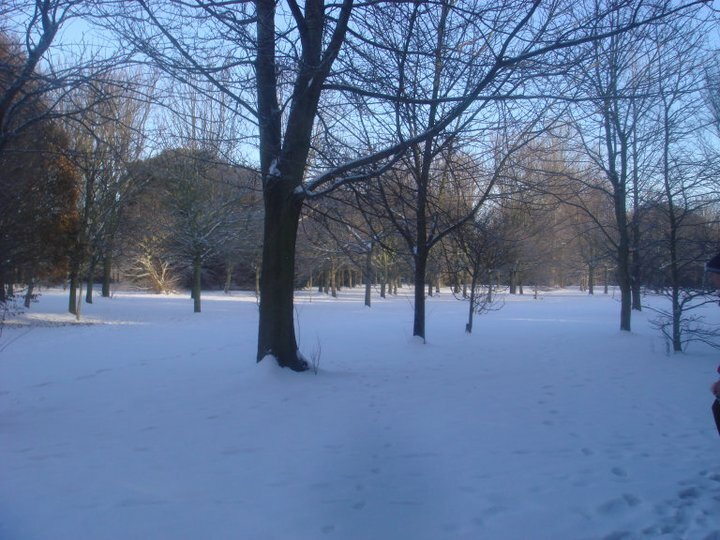 The meeting will take place on Tuesday 26th April in St. Anthony’s Hall in Clontarf at 8 p.m.
St Annes' Park, Christmas Day 2010. See the Clontarf Residents Website for wonderful views of Clontarf, including the promenade and sea front, during the big freeze in November and December. All photographs are taken by local residents. My photograph inserted here is of St. Annes Park in Raheny, and the park has significance for the wild bird population dependent on Dublin Bay. Cormorants nest in the tall trees overlooking the sea, and large flocks of Canada geese graze on the wide grass fields across the park. 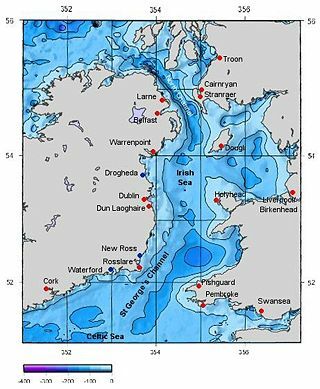 The Dublin Regional Authority is the lead agency for the Irish Sea Regions project with Belfast, Merseyside the Isle of Man, UCC and the North West Development Agency in the UK are all fully committed to developing a strong Irish Sea regional grouping. The vision behind the idea is that all of the city-regions of the Irish sea will work together to address the challenges facing the Irish Sea – protecting its marine ecology and building tourism, fishing, and tidal and wind energy. There is significant potential here, and in particular its important that any future Dublin Bay plan fits into, and compliments the work of the Irish Sea Regions Platform. EU Regional funding will be sought for the project and I imagine there will be a full day’s work shop if the application is successful to make sure all the agencies and NGOs are fully involved. v To establish a Platform as a vehicle for increased cooperation across and within the ISR, bringing together politicians and representatives of national, regional, city and local governments, statutory organisations, universities, marine, environmental, fishing, energy and transport sectors, private sector, NGOs, etc. v To promote the ISR as a ‘Functional Area of Co-operation’ within the European macro regions context, and as a brand for economic growth, enhanced competitiveness and environmental sustainability. v Promote the concept of environmental sustainability, competitiveness and management of natural resources among communities around the Irish Sea. Seán Dublin Bay Loftus R.I.P. Seán passed away on the 10th July, and my sympathies are with his wife Una and children. A former Lord Mayor of Dublin, Seán Dublin Bay Loftus worked tirelessly to defend Dublin Bay and battled long and hard against Dublin Port Company and its plans to infill the bay. Great news yesterday, Dublin Port’s application to infill Dublin Bay was turned down by An Bord Pleanála. Well done Dublin Bay Watch and Clontarf Residents Association, their legal teams, and especially Bird Watch Ireland for their strong evidence at the Oral Hearing, delivered by Siobhán Egan. Labour Party Representative for Dublin North Central, Cllr Aodhán Ó Ríordáin, also welcomed the decision. “I am delighted that An Bord Pleanála have made this decision and finally put to bed the decades old controversy over the proposed infill of Dublin Bay. Myself and my Labour Colleagues Bronwen Maher and Tommy Broughan have fought long and hard against the Port Company’s proposals over many years and we are thrilled that An Bord Pleanála has listened to our views. “It is however disappointing that An Bord Pleanála declined to accept its own Inspectors’ recommendation to refuse permission on several other points, including the unacceptable risk of flooding of the Clontarf area. 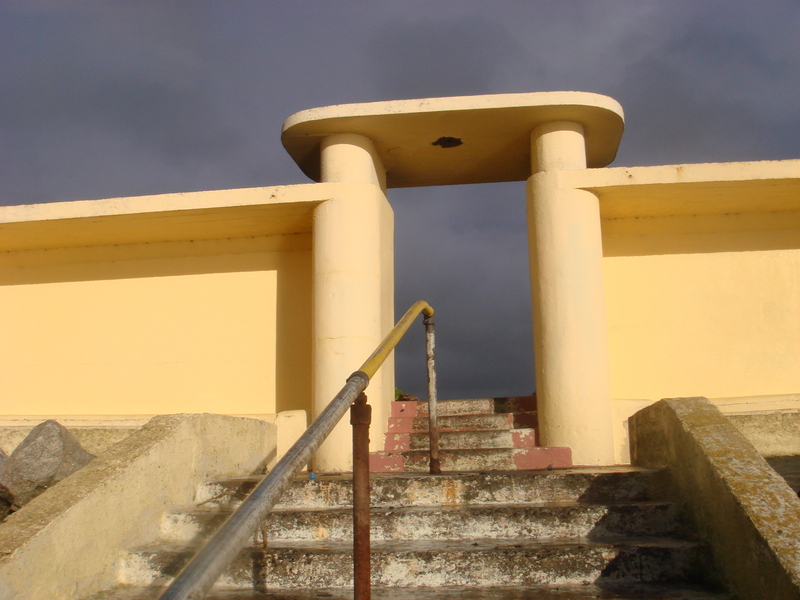 The Bull Wall in Clontarf is home to these fine Art Deco bathing shelters. See also Mark Nixon’s exhibition of photographs taken along the promenade. 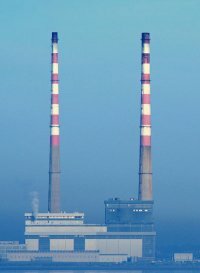 The iconic Poolbeg chimneys are due to be pulled down unless some idea can be salvaged to ensure their future. Apparently they will be too costly for the ESB to maintain. Despite launching the Dublin Bay Task Force in a blaze of publicity in June 2008 John Gormley has failed to respond to the many recommendations and subsequent requests for action submitted more than fourteen months ago. Labour Party representatives Cllr Aodhán Ó Ríordáin and Bronwen Maher have strongly criticized Environment Minister John Gormley for his lack of action on Dublin Bay. Question: To ask the Minister for the Environment, Heritage and Local Government his views to the report and recommendations submitted to his Department by the Dublin Bay Task Force and Dublin Regional Authority in 2009; when he will respond to the Dublin Bay Task Force and the Dublin Regional Authority; his plans to instruct the Dublin Regional Authority to develop a master plan for Dublin bay; and if he will make a statement on the matter.